There's plenty to see in and out of Baguio that spending a few days in the Summer Capital of the Philippines wouldn’t be enough! Making the City of Pines your destination of choice will let you experience one of your best adventures yet. The cold weather in the mountains, the warm welcome from the locals, the sumptuous food choices, and the rich culture and heritage up north makes Baguio one of the top places worth seeing in the Philippines. I was feeling 50/50 when it came to visiting the Laperal White House, as it was known for being a haunted place. Sadly (for my friends), the guesthouse was already closed down for public viewing (said to be no longer sustainable due to insufficient funding). I actually felt a sigh of relief, as I no longer had to endure my fear of exploring it. It might have housed a gallery and some rooms that were filled with lots of history. Then again, those weren’t enough to encourage (more like push) me to take a tour of the abode. Don't get me wrong. I would definitely visit Laperal if I wasn't such a scaredy-cat. But at that moment, I just stood and admired the structure's deteriorating yet still beautiful façade from afar. This recreation ground, which overlooks the Amburayan Valley and the mining town of Itogon, has gone through a beautiful transformation. Now gated, Mines View Park still offers the same scenery and activities but has a cleaner and pleasanter setting. It’s actually a nice destination for shopping (from flowers, herbs to clothes) and picture-taking. You can also visit the mini-museum inside the park, which is located just by the entrance. If you’re looking for the best-tasting pasalubongs from Baguio (just a short walk from Mines View Park), then this is your go-to place. A variety of these goods (i.e. fruit preserves, ube and strawberry jams, peanut brittle, coco jam) that were made by the Good Shepherd nuns are some of the most sought-after items in the City of Pines. Their small jar of Ube Jam, which costs P250, is by far, the best version that I’ve tasted. TRIVIA: The money that is generated from the sales is used to fund the charities that the nuns sponsor. They also use it for the preservation and upkeep of the nunnery. Camp John Hay is a huge recreational complex. The area is packed with a lot of things to do (i.e. play golf, hike trails, take landscape photos, stay in cozy hotels) and things to see, that a day of exploration won't be enough. While there’s plenty of places to mention, my favorites are the Bell House, Amphitheater, Cemetery of Negativism, Butterfly Garden, and Choco-late de Batirol. Getting around Camp John Hay can be a bit of a challenge, especially if you're not driving your own vehicle. It’s not accessible by public transportation, except for cabs. But if you fancy walking long distances (make sure to wear comfy shoes), then you'll surely manage. One of the best things that you can do before exploring Baguio is to visit a gallery that's solely dedicated to it: the Baguio Museum. The 4-floor structure is filled with displays that exhibit the city's history (from old documents to photos of significant people who helped shape the city), as well as artifacts from local indigenous groups. You might also find its distinct built astonishing, as the structure was made to resemble a huge Ifugao house. I’ve been here several times that I’ve already lost count. Yet visiting this place never gets old. While it's prohibited to explore the actual residence, my group and I were able to walk up to the top (just in-front of the house) for a photo-op because a ‘friend’ let us in for a brief moment. If felt eerie at some point, so we didn’t stay long. Nonetheless, it was an interesting experience. TRIVIA: The main gate, which is probably the most photographed in the compound, is said to be a replica taken from the Buckingham Palace in London. Another interesting site that is just across the Mansion's gate is Wright Park. While riding ponies is a well-loved activity here, the Pool of Pines is also an attraction in the area that is worth checking out. It's one of the most picturesque spots in Baguio, especially when Sunflowers start blooming around the rectangular body of water. This well-recognized landmark in the city is the biggest catholic church in Baguio. The two-tower cathedral, which has a high ceiling, has walls adorned with stained glass décor that's worthy of admiration. I once heard mass here, and it was good and solemn. Listening to the priest, while the cool breeze entered its open doors was a calming experience. NOTE: Make a wish if you're visiting this church for the first time. Session Road can be one of the busiest areas in Baguio, given that it's the main access route of the city. But don't let that stop you from exploring the well-known thoroughfare. You'll find that Session Road is packed with a good mix of history, culture, and heritage. You’ll never run out of things to do (go shopping at SkyWorld Ukay-Ukay) and dishes to try (eat in Ili-Likha or in Oh My Gulay) when you’re around. Address: Session Road is the main hub of what is called the Baguio Central Business District. I wasn't able to check if the Baguio City Post Office is still operational. But what I did discover when I visited the area was the painted, concrete steps that fronted Session Road. A photo-op here is a must. Surely, the pictures you will take will complement your Instagram or Facebook feed. As a UP Alumna, having the chance to visit other UP campuses is exciting. I’m actually glad that I got to see UP Baguio because my Kuya and I discovered that Museo Kordilerya was part of the college grounds. Newly opened this year, the 2-story gallery exhibited wax figures wearing indigenous garbs. There were also other Cordillera artifacts on display (ranging from documents, old mechanical devices, books, journals, textile, photographs) that were worth reading and viewing. If you’re looking to bring home some fresh or dry goods, then this is your go-to pasalubong center. The Maharlika Livelihood Complex offers a wide selection of products, which ranges from fresh fruits, vegetables, and meat to dry goods such as bags, clothes, and handicrafts (amongst other things). I fell more in love with Baguio because of their rich culture and heritage. I've even managed to build my own business by drawing inspiration from the Cordillera Administrative Region. And it was during one of my trips back to Benguet that I discovered Easter Weaving Room. The weaving center isn't just comprised of indigenous fabrics and handicrafts. It's also home to some of the most talented and dedicated women up north. Here, you'll be able to watch how native textiles are made using traditional looms, and how each fabric produced tells a story. I would encourage you to talk to the women and to ask them about the fabrics that they're weaving. Not only will they graciously share you their time, they will also share the stories behind the handcrafted designs. In this way, you will be able to gain a deeper appreciation of our Philippine culture and heritage. While this 2-story shop is small in space, it graciously houses a good line-up of on-sale books from local (mostly Philippine literature and scholarly work) and foreign authors. You can browse through a wide selection of publications from this independent bookshop, and even take photos inside, as it’s picture-worthy. I found my latest trip to the Botanical Garden quite surprising. While it lacked the usual blooms (my previous visits were last May and August), I was still amazed to know that there were other interesting areas in the park that I haven’t seen before. Take for example the Japanese Tunnel. The claustrophobic in me didn’t want to go in, as it exuded a tight and eerie setting. But once I went in with my friends, the underground passage started to look okay. Exploring its short route can be best viewed with a flashlight in hand, as there weren’t many lights to illuminate the pathways. Nonetheless, it was quite an experience. Your trip to Baguio will not be complete without visiting Burnham Park - the heart of Baguio City. The 'mother of all parks', which is one of the iconic landmarks in town, was designed by and named after the American architect and urban planner, Daniel Hudson Burnham. The recreation ground is known as a place of gathering. Both locals and tourists come here to relax and to have picnics with their loved ones. Even kids and the kids-at-heart can ride the boats by the man-made lake, or bike around the play area. Eateries and Ukay-Ukay shops are also plenty outside the park, so you’ll never run out of food and things to buy. Aside from that, Burnham Park comprises a playground for kids, gardens, a grandstand, and a football field (amongst other facilities). Kennon Road is one of the three main access roads that will take you to Baguio. Dropping-by the viewing pavilion will be worth it, as it will show you a scenic and panoramic view of the mountains. This is actually an ideal stopover, especially if you’re looking for something refreshing to see, with a little bit of history to it. Here, you will find a memorial that’s dedicated to the American, Filipino and Japanese workers who helped and finished the well-known highway. You are free to explore the Philippine Military Academy, as long as you respect the environment that you're in, especially when officers are in training. The PMA has become the training school of the Armed Forces in the Philippines, which has since produced some of the best Filipino men and women for military service. You will surely find some of the cadets executing their drills when you roam around the grounds. PMA also has a museum that will walk you through its history and background. And as you go along, you will also discover other interesting sites that display vintage tanks and other historical military weapons. Named after the owner and National Artist, Benedicto Cabrera, BenCab Museum houses some of his permanent collection, several of which consists of paintings, drawings, prints, and sculptures. The gallery also shows a rich display of Philippine culture and heritage (mostly inspired by the Cordilleras in the northern Philippine highlands), some of which might strike you in more ways than one. And as part of BenCab’s vision, he also opened his space for other Filipino artists to use as a platform for their artworks. When you’re done roaming the grounds, you can dine by the indoor restaurant, Café Sabel. Here, you can admire the breathtaking vista in front of you. It might not be Strawberry season all-year long in Benguet (the fruits are more expensive when it’s not in-season). But a trip to the Strawberry Farms in La Trinidad are still worthy of your time and admiration. Strawberry picking is one of the things that you can do here, along with other vegetable choices (there are lettuce varieties too!). You can access the Strawberry Farm easily, as it’s just a 30-minute drive from Baguio. You’ll know you’re near as soon as you pass by the famed Stobosa Houses - hillside homes that were painted to show a colorful mural. Tam-awan Village, also known as the 'Garden in the Sky', offers its guests a taste of Cordillera culture and heritage. Here, you can stay in an authentic Ifugao hut, experience being in a Dap-ay (stone-paved gathering place) with friends, explore its art galleries and craft shops, or sip a hot drink in their coffee shop. If you're into authentic Spanish cuisine, then Te Quiero is your place! I've managed to get myself stuffed with all of the dishes that were served to us, as each one was that good. You can read my full review HERE. For Ilokano-inspired dishes, dine at Kalapaw. I found their food offerings to be as tasteful and value for money. I was actually surprised that they had Pako Salad (Fiddlehead Fern Salad) on the menu, which has been a recent favorite of mine. I was surprised that for a carenderia (a 2-minute walk from Microtel Baguio), this eatery served a lot of tasty Filipino cuisines. For an affordable price range, my group and I were able to sample a variety of local dishes. So if you’re on a budget but looking for something good to eat, this no-frills canteen is your place. While the original Café by the Ruins caught fire last May, its second branch along Upper Session Road is fully operational (serving some of its bestsellers). With an art-inspired décor and interior, this well-loved restaurant has been a landmark on its own. A trip to Baguio will not be complete without stopping here for a meal or two. This specific location in Baguio is quite special to me because this was the first place where my father brought my brother and I. We went straight to lunch at Barrio Fiesta after enduring a 7-hour bus ride from Manila. So it was quite surreal when I was able to bring my brother in the same area, but this time, to try and sample other local dishes. I'm glad that Barrio Fiesta is still around, as there were other interesting additions by the steps such as Pamana, The Original Hawaiian BBQ, and Tsokolateria. I've only tried Pamana in Quezon City. But Tsokolateria, I was able to sample last May. You should definitely try their Tablea Churros Waffle because the size of this sweet creation can be shared by two people. Casa Vallejo, where Hill Station is located, is just beside the Igorot Stairs. It's also both an inn and a restaurant. Walk-in guests are allowed to dine here, so lucky for us. Though my Kuya and I weren't able to explore much of their menu, we made sure to try their breakfast offerings. Ambiance-wise, the restaurant exuded a cozy and warm setting despite the cool breeze coming in through the open windows. Now, as for the food, it was, unfortunately, so-so. We both ordered the Pinoy Breakfast and were left disappointed. Not only was our garlic brown rice soggy, we also couldn't taste the garlic in the mix. The garlic longganisa, on the other hand, was just okay for my taste (all I can say is that I've sampled far better variations). But at least, our scrambled eggs were good, and that the hot Tsokolate that I ordered was creamy and delicious. If you're looking for a restaurant that offers some of the best Filipino dishes and drinks, then you should take a trip to Choco-late de Batirol in Camp John Hay. I've managed to dine here thrice (in May and August), and I still can't get over the food and tsokolate that I sampled from the eatery. Their specialty, of course, is their Choco-late de Batirol, which is so good and creamy that you'll love it at every sip. But other than this bestseller, you should also sample their Turon de Langka, Sinigang na Bangus and Beefsteak. The prices are affordable. Just make sure to bring in extra funds, in case you want to try other dishes from the menu. What I love about Baguio is its interesting hole-in-the-wall eateries and shops like Ili-Likha Artist Village. It's just one of the many places that are worth discovering and experiencing when in the city. While Kuya and I didn't get to order from all of the eateries inside, we managed to try this shake from Brrrgrrr Bistro, which was refreshingly good. The area is a bit cramped. But if you're looking for a chill place where you can have a quick bite with family or friends, then check out this place. It also showcases different mediums of artworks from local artists, which are all Instagram-worthy. One of the things that I tried when I was going around Baguio solo was to try their "turo-turo", which you'll find plenty outside of Burnham Park. I've managed to keep my belly full just by spending less than P150 (I was on a budget). This already included a long and juicy slab of grilled Liempo, Ensaladang Talong (slices of eggplant, tomatoes, onions, and bagoong), plain rice and a cold bottle of Juicy Lemon soda. The setting wasn't the best, in terms of cleanliness. So if you don't have the stomach for it, then you might want to try other nearby eateries. Personally, it was okay. Plus, it was an experience on its own. If you're into craft beers, and wouldn't mind sampling the ones in Baguio, then visit the Baguio Craft Brewery, "Baguio's first and only craft brewery with freshly-brewed beer with 50 rotating taps". Kuya was able to try their Kabunyan flavored beer, which he said tasted similar to his favorite pale drink. You'll be happy to know that their drinks are free of preservatives, additives nor adjuncts. They also have festive and non-alcoholic party drinks like their 'Speakeasy Mocktails' (their Cucumber and Basil Lemonade is the best! ), and some tasty grub like their Buffalo Wings. If you're craving for Italian food in Baguio, then you should try Amare La Cucina. I absolutely loved their oven-baked pizzas, as well as their pasta and salads. Their food did not disappoint. Plus, their serving time was fast. My friends and I (a group of 10) ordered a bunch of dishes, all of which we were able to finish in just one seating. We had Hawaiian Pizza, Al Arrabiata Pasta and Ala Carbonara Pasta, and Insalata di Pollo. I've only eaten at Ebai's once, yet I can never forget the Pork Sinigang that we ordered from the restaurant. The sour taste of the soup, matched with the slightly salted pork was everything that I wanted in my all-time, favorite Filipino dish. You won't miss the eatery, as it's just beside Narda's, and just a short distance from Microtel Baguio. Forest House, which is a family-owned business, operates as both an inn and restaurant. The cozy food establishment, which exudes a log cabin setting, has its own receiving area, complete with a fireplace. While their food offerings are a little pricey, everything that we ordered was worth every penny. Their dishes were plated beautifully and were served with a lot of great flavors. You should also try Baguio's Strawberry-flavored Taho and Strawberry Ice Cream. You will find several vendors selling these local desserts all-day, almost anywhere in the city. A hot cup of taho is perfect in the morning, while a scoop of ice cream can provide a refreshing taste to the palate, especially after a long day of exploring the city. Microtel Baguio - Read my full review HERE. Upstairs Bed & Bath - Read my full review HERE. 1896 BNB - Read my full review HERE. 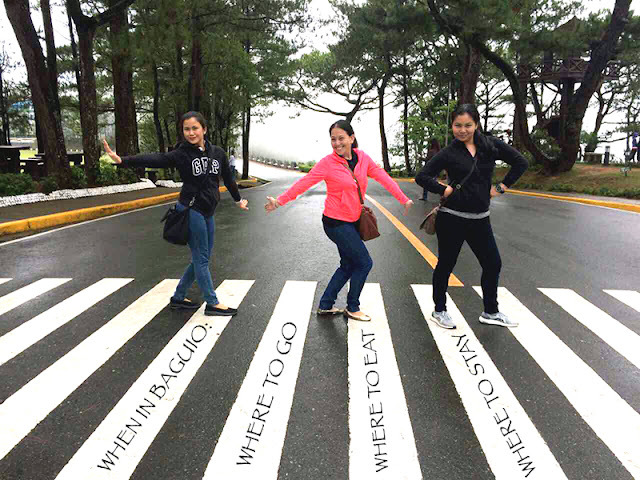 Hi, what month of the year do you think is the best time to visit Baguio with kids? I'm so sorry for the late reply! I hope you receive this message in time. With regards to your question, I think the best months (for me, at least) are November-April. :) These months are the coldest, and with the least (seldom) rainfall. :) It feels uncomfortable (especially for me) when I visit Baguio when it rains. So make sure to visit with kids during the dry season.